Maybe committing to consistent, daily quiet time and going deeper in prayer are nothing “new” to you. Either way Mom, I do hope you’ve found some new approaches and encouragement in class 1 and class 2 to keep pressing on and into Him! Learning to communicate with our children is no small task! It takes commitment, patience, humility, and prayer…. much prayer! But, having real, meaningful conversations and clear communication helps build the parent-child bond in so many amazing ways! It should really be no surprise then that it’s also a top heart parenting struggle I hear from Moms. 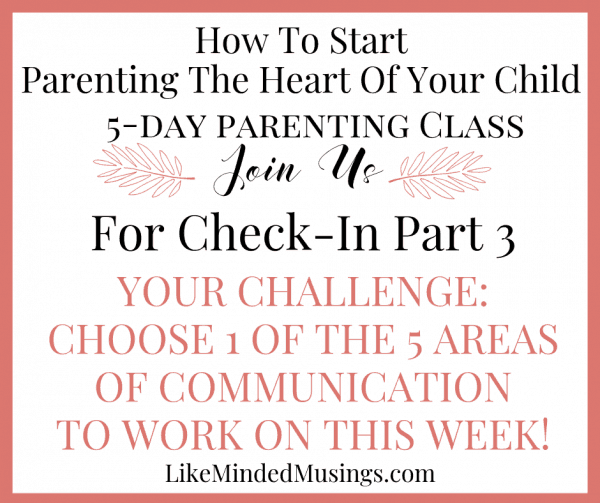 As an “over communicator type” navigating this parenting journey myself, I hope to share some practical tools and encouragement with you today! I know, I know. But I can’t not make this #1. Just hear me out! Prayer is a HUGE key in how to communicate with your child. Praying that God would give you the words to say. That He would bless you with the patience to handle their heart and give you an open heart to share with them. Also, praying for their heart to be willing to communicate with you. It’s also important to note praying with your child. I believe having intentional times of prayer with your child helps to cultivate a soft and open heart. 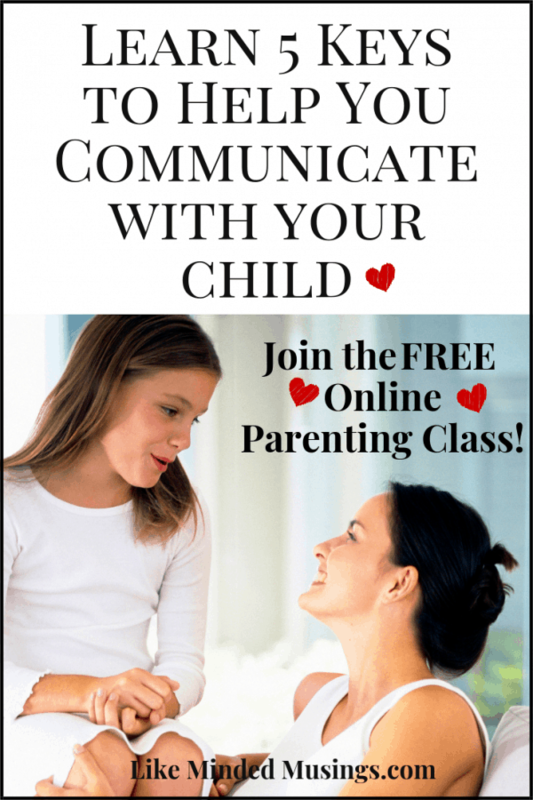 Find Out How To Communicate With Your Child’s Heart! Learn 5 Keys to start today! Praying with them keeps our hearts humble. It shows them the areas that we need to work on and that we are not afraid to ask for God’s help with our struggles. It puts a quiet space between us both that only He can fill and helps establish God as the one to go to in all circumstances. On the other side, prayer with her also unites you both like nothing else in life. It’s a good thing all around! (BTW if you are looking for some encouragement in praying for your daughter, I found an incredible resource for Moms of Girls I Love this! It may not be the most comfortable of positions to take with our kids, but in my heart it is necessary. The world isn’t afraid to tell them anything, so I believe we should not be afraid either. I want to be the go-to source for questions, even on the hard topics like this and this. By encouraging them at an early age to ask me whatever they want, I hope to set a firm foundation for discussing the harder life topics to come. Yes, as much as possible. When they’re little they will usually have about 10,952.4 answers for every 1 question you ask, but it establishes a great habit for your relationship as they get older and don’t want to talk as much. It also won’t seem weird or uncomfortable that you are asking questions. They will be used to it. So ask away… even if you get an eye roll as they get older. This also teaches them that it is ok to earnestly ask God questions. Also how to seek Him daily. It’s what we appreciate from them and I often forget how much they appreciate it in return. Listen actively. This means all the pieces to the puzzle. Eye contact. Stop doing. Ask questions. Repeat back things they say so that they know you are listening. This all goes a long way with them, especially in larger families or bigger groups when it’s harder to do. When someone is transparent with us, it encourages us to open up. This isn’t any different with our children. They appreciate knowing Mom doesn’t really have it all together and is not going to just pretend. They grow in empathy when they realize that you are battling something. They know what our real family looks like in the day-to-day vs the social media picture. Plus, they’re often quicker than we give them credit for so no sense in covering it up! Believe me, Mom, I know it’s tough. It’s hard to spend time and effort to communicate with their hearts when all you feel like doing is throwing out a “because I said so”. But communicating with the heart is what God does with us. We can trust that it will be worth it to make the effort and be diligent in communication. Leave a comment and tell me your plan, send me an email or text in the messenger chat in the bottom right corner. Tell a friend or join us in the Like Minded Musings Imperfect Moms Private Facebook Group for accountability, connection and encouragement in Faith, Family, and Homeschool! Don’t Miss the Other Sessions in the How to Start Parenting the Heart of Your Child: Free Parenting Class! How to Encourage Open Communication With Your Tween + Free Tip Sheet! How to Encourage Deeper Conversations With Your Tween- Here’s Help! !